MindSpring is a group programme for refugees about life in exile. The programme gives group members new knowledge, raises awareness and gives them new skills, which can help them manage issues related to their situation. MindSpring is a group programme with, for, and by refugees and immigrants. The MindSpring method empowers the participants via new knowledge, reflections and competences about issues related to living in exile. MindSpring can furthermore create the basis for a social network. The MindSpring program features themes such as stress, identity, trauma and general challenges related to living in exile. 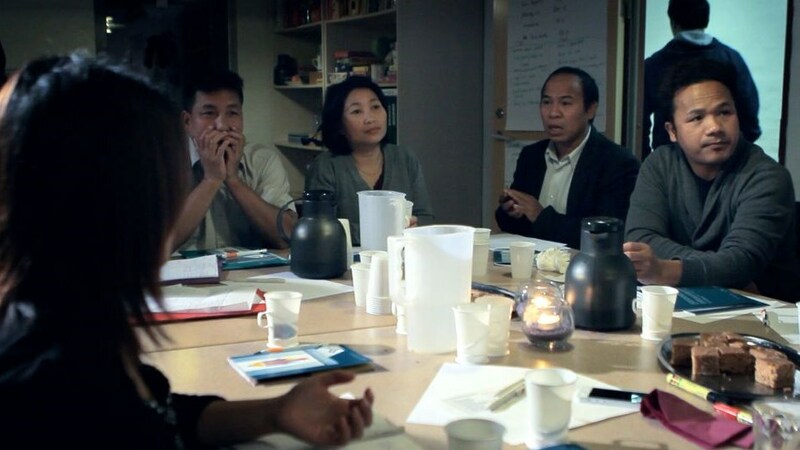 The MindSpring method is unique in the sense that the group program is facilitated by a volunteer sharing background and language with the participants. This volunteer is called the MindSpring trainer. Because of a shared cultural background and experiences with living as a refugee in Denmark, the MindSpring trainer can recognize and understand most of the issues and living conditions of the participants. This is the basis for feeling safe and included in the group. Furthermore, the identification between the participants and the MindSpring trainer creates a safe space for learning, which enhances the outcome for the participants. The MindSpring trainer is collaborating with a professional called the “co-trainer”, a professional employed in the organization where the group is organised, e.g. a municipality, school or a social institution. The main task for the MindSpring trainer is to guide and lead the group through the formulated themes with the co-trainer, who contributes with professional support. For example, the co-trainer can provide facts regarding available welfare services or information about the local environment such as where to find professional help. The MindSpring groups are conducted in the mother tongue of the participants, so an interpreter translates simultaneously for the professional co-trainer, who will most likely not speak the language of the group. The purpose of MindSpring for parents is to empower and support their parenting skills as well as to prevent or counter family related and psychosocial problems and failure to thrive amongst their children. In MindSpring groups for parents, the focus is on parenting and child education, norms and values, the rights of children as well as identity, stress and trauma. Thus, the main theme is exile-related issues stemming from educating children in a new cultural setting while being affected by a past of war and flight. The purpose of MindSpring for young refugees is empowerment through the prevention of failure to thrive psychologically and socially as well as the strengthening of identity and possibilities. In MindSpring groups for youths, focus is on adolescence, loneliness and community as well as stress, identity and trauma. Thus, the main theme revolves around the issues related to living in exile which follow from the process of developing into adulthood while being affected by a past of war and flight. The purpose of MindSpring for children is to prevent psychological and social issues felt by the refugee children. The programme is to strengthen the children's identities and self-images, connection to their emotional lives, knowledge about reactions to stress and trauma as well as offering means to cope with difficult emotions in everyday life. In 2016, MindSpring Kompetencecenter recieved a grant from Det Obelske Familiefond to develop the MindSpring-method for children aged 9-14 years old. The development was initiated during spring 2017, and MindSpring Kompetencecenter educated the first volunteer-trainers November 2017. Thus, the first course for children saw the light of day during spring 2018. Since 2010, The Danish Refugee Council (DRC) has developed and implemented the MindSpring method in Denmark. The DRC is continuously developing the method to address new target groups with exile-related issues. MindSpring was founded in the Netherlands by the psychologist Paul Sterk and is now practiced there, as well as in Belgium, Sierra Leone, Burundi, Iraq and Afghanistan. Read more about the MindSpring foundation. Want to know more about how MindSpring has developed in Denmark through the years? Click the button and learn more about our history.